There are two major types of wind turbines. 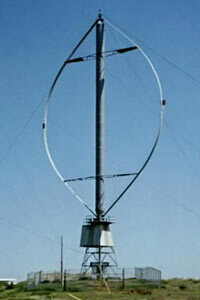 A vertical axis wind turbine is one which rotates around a vertical axis. Each type of turbine is based upon the axis on which the turbine rotates. Vertical axis wind turbines (VAWTs) are less frequently used, as they are not as efficient as horizontal axis wind turbines. The rotor shaft of a VAWT is designed to operate vertically. The main advantage of a VAWT is that the turbine doen't need to be oriented to face into the wind to be effective. As a result, VAWTs can use wind from all directions. This is particularly useful on sites with highly variable wind direction. Another advantage of a VAWT is the generator and gearbox can be placed near the ground. This makes it faster and easier for maintenance to be carried out. There is also no need for a tower to support it, cutting down construction and possibly also maintenance costs (depending on the design). So why are VAWTs less common than horizontal axis wind turbines (HAWTs)? They have some major drawbacks. Some VAWT designs produce pulsating torque, and drag is often created when the blade rotates into the wind. VAWTs are difficult to errect on towers. This means they are predominantly installed on the base which they rest upon, such as the ground or a building. As wind speed is slower at lower altitudes, less wind energy is available to harness. Also, air movement nearer the ground can create turbulents which cause VAWTs to vibrate and to operate with increased noice. The result is increased wear and tear which increases the maintenance. Most VAWTs produce less energy than HAWTs. VAWTs run at about 50% of the efficiency of HAWTs. This is mainly due to the additional drag that VAWT blades have - as they rotate into the wind. While the parts of a VAWT are located on the ground, they are also located under the weight of the structure above it. This can make changing parts nearly impossible without dismantling the structure. 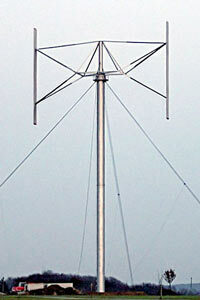 There are different designs of vertical axis wind turbines. These are listed below. Commonly descibed as an "Eggbeater" turbine, the Darrieus VAWT generally have good efficiency. 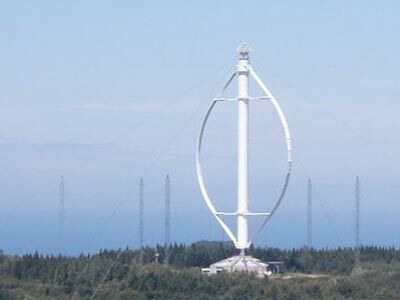 The downside however, is that they produce large torque ripple and cyclic stress on the tower, which contributes to poor reliability. Darrieus VAWTs generally require some external power source to start turning as the starting torque is very low. The torque ripple can be reduced by using three or more blades, resulting in a higher solidity for the rotor. A giromill is a subtype of the Darrieus VAWT. The giromill has straight blades, where as the Darrieus has curved blades. The cycloturbine variety has variable pitch to reduce the torque pulsation associated with the VAWT design. Giromill VAWTs are also self-starting. These are drag-type devices with two (or more) scoops that are used in anemometers, Flettner vents (commonly seen on van roofs), and in some high-reliability low-efficiency power turbines. 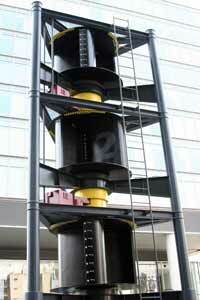 A Savonius vertical axis wind turbine is always self-starting provided that there are at least three scoops.